I told you to ask for directions! Did this pilot land at the wrong airport? 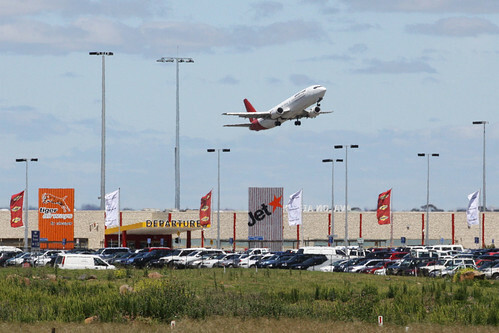 Qantas doesn’t serve Avalon Airport, only Jetstar. This train belongs to Metro Trains, who operate the suburban railways of Melbourne. So what is it doing out in Ballarat where V/Line runs the show? Car ferry ‘MV Queenscliff’ plys the waters between Queenscliff and Sorrento all day. So what is it doing berthed at Melbourne’s Docklands, a few hours away from her normal home? Qantas uses Avalon Airport as a training base for their pilots, a location suited to the task because of the full length runway and the small number of commercial flights using it. Pilots usually spend a few hours at a time flying circuits and performing touch-and-go landings at the airport: my photo is back from 2010 and shows Boeing 737-400 rego VH-TJR. Melbourne’s new XTrapolis trains are being assembled in the railway workshops at Ballarat, where a new 6-car set rolls out of the factory about once every 4 weeks: my photo shows one of these delivery runs. The body shells for each train are built in Europe and shipped to the Port of Melbourne, then transported to Ballarat by road on the back of a low loader. 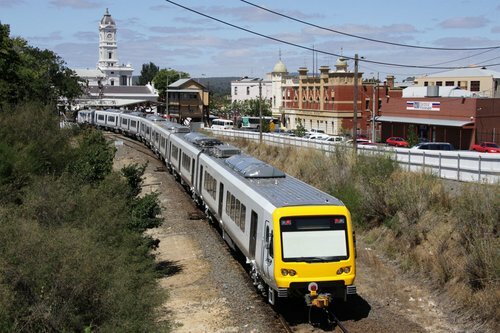 Because the railways of Ballarat has no overhead wires, each completed unit has to be towed back to Melbourne behind a diesel locomotive before they can be tested under their own power, and if all the tests pass the train can then be placed into revenue service. 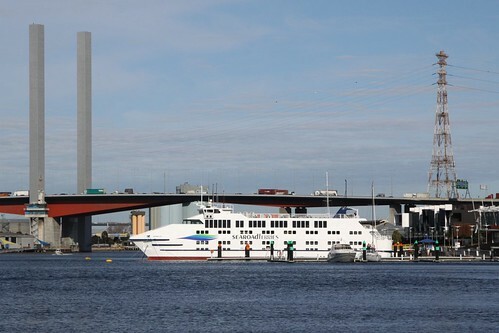 Car ferry ‘MV Queenscliff’ was berthed at Melbourne Docklands for an open day held on September 25, 2011 to launch the new corporate image of Searoad Ferries, the operator of the Queenscliff-Sorrento car ferry. She was refitted at a dry dock in Tasmania over the past few months, and sailed back to Melbourne the day before the open day. As for finding someone looking a bit lost, it appears I’ll have to try a lot harder to embarrass the professionals. A bit further, bit further, OOPS – too far!